Three of Swords (R) shares that it is always hard to bear the pain of separation or understand why we can be inflicted with such sorrow. Learn to be receptive to circumstances which are not constructive learning situations and consciously make the choice to remove yourself from any situation which produces sorrow or negative vibrations. Become aware of your natural “inner” sources of creativity and release any dependency on others for your ideas. Concentrate your efforts on organization – see the past as a whole picture. Stop limiting your viewpoint by focusing only on the smaller aspects which created the sorrow and heartache – this only causes confusion. Be the peacemaker – never be afraid to say you are sorry. Always think before you speak so that you will not feel sorry after it’s too late. When something “appears” so painful that you find yourself trying to push it away – trying not to think about it and avoiding any reminders of it – realize that this attitude only keeps the pain within you and actually increases its hold on you. Learn to accept your situation so that the healing process will not become blocked. Allow yourself to experience the pain – give yourself the right to grieve and release the heartache. Let it go – then, once the upset, pain and tears have gone – open the door to new experience. Your aching heart will need someone. Some difficulty exists in integrating lower emotions into requirements of mind. Mind may not be integrating/using heart energy properly. Difficulty with self-expression or expressing too much. Too secretive, too gossipy. Illiterate or too literate. On one extreme, anger/loss of control – on the other extreme, placid to a fault. Misunderstanding and misuse of mind in relation to heart. Introverted or too extroverted. Shy or too verbose. In what ways are you suffering? Has anyone hurt your feelings? What are you feeling sorrowful about? Who would you like to hurt or “get back at”? Can you look at your relationships with truth and honesty? What do you fear most within your relationships? 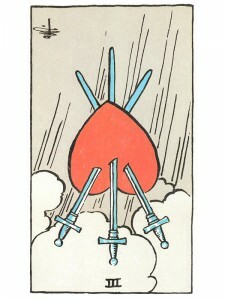 Lovers in the spread with swords on all sides: Indicates the severing of a close relationship. Next to Emperor: You have been hurt by criticism and unfair judgment – do not pursue or try to change things, just start fresh and do not be afraid. Next to World: A Karmic situation is nearly over, prepare for new events in your life – the future holds much promise. In the first position: Your temptation will be to rush your programs. Remember to be patient while synthesis is evolving. Work to develop consensus even though you are confident with your evaluation and want to get on with things. In the second position: Do not let your penchant for organization become an end in itself. Neither go to the opposite extreme of not having the organization and clarity you might need for contingencies as well as for daily physical needs. In the third position: Be patient, your mind is waiting for the energy the heart must give it to move forward. That process is evident in this reading. In the fourth position: The passions of the heart must never yield entirely to the mind. The path is love, not an exercise. In the fifth position: Here you may be either too forward or too backward. And while there may be hesitation from lack of confidence, you might well be avoiding the discipline and work required. In the sixth position: Your mental growth is positive and proper for your path, but it doesn’t have to be aggressive or subdued to avoid conflict. In the seventh position: While you certainly need not fear this extroversion of your personality and goals, you should not race ahead expecting the waters to part as the world falls at your feet. You must be convincing at each step. In the eighth position: Be sure that it is your best foot that you put forward. When cleaning house, do not throw the baby out with the bath water. In the ninth position: A heart that is too immersed in the swirl of the mind, refusing to come out into the physical world or a heart that refuses to fund the energy necessary for such mental projects. In the tenth position: You will need to be patient, as your mind waits for the energy the heart must give it to move forward. That process is taking place. The lessons presented in this reading are aimed at helping that happen now. The knowledge you will have acquired outpaces temporarily the heart’s motivation to use it to maximum effect.